These super bowls make healthy eating easy. Life can feel a bit tough if you're trying to be healthy and do the whole 'your body is a temple' thing. Weekends are often filled with cocktails and doughnuts and burgers and chips and ice cream and cake. 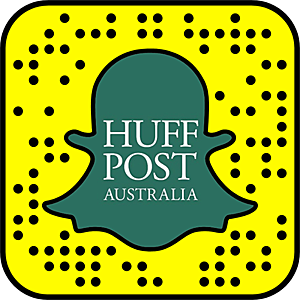 Which makes weekdays plain boring and sad because you've probably got steamed broccoli and chicken breast in front of you. WELL. Here are some recipes that will be music melted chocolate to your ears. 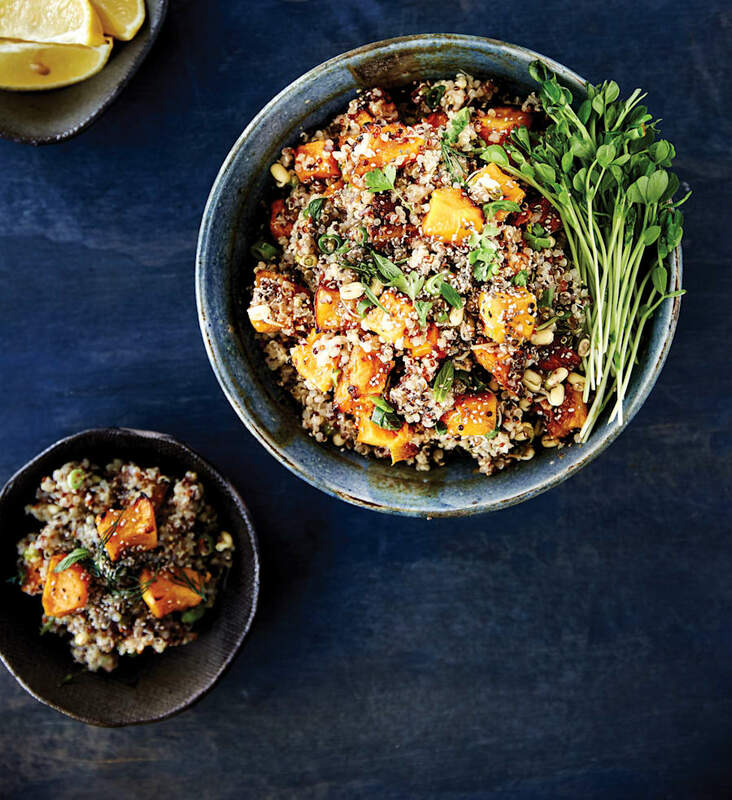 These delicious yet healthy dishes from Whole Food, Bowl Food by Anna Lisle are easy to make and are all about using fresh, colourful plant-based foods. Better still, these meals are what cool people call 'bowl food', meaning they're not only trendy and aesthetically pleasing, but they're also great to eat on-the-go, or to take to work or school. 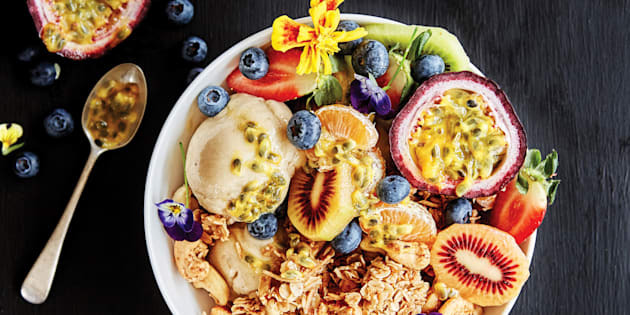 "I feel as though I harp on about the superiority of homemade granola so I won't waste my breath here, except to say that this is my favourite combination yet," Lisle said. "Banana nice cream is my secret kitchen trick -- when frozen banana is blended, it makes creamy and thick ice cream (due to its high pectin content)." Gluten free, dairy free, vegetarian, vegan and refined sugar free. 1. Begin this recipe the day before by placing the peeled bananas into a container or zip lock bag to freeze overnight. 2. Preheat oven to 160°C (320°F) and line a tray with baking paper. 3. In a large bowl combine all the dry ingredients: oats, cashews, macadamias, dates, coconut, cinnamon, mixed spice and salt. 4. Heat maple syrup and coconut oil in a small saucepan over a gentle temperature. Once the coconut oil has melted, add vanilla and pour over the dry ingredients. Toss to combine. 5. Spread mixture evenly onto the lined tray, and bake for 30 minutes, stirring once about halfway through. Remove from the oven and leave to cool completely -- do not stir at this stage. 6. When ready to eat, make the banana nice cream. Blend frozen bananas with a high-powered stick blender or food processor and purée until smooth, stopping occasionally to scrape down the sides. 7. 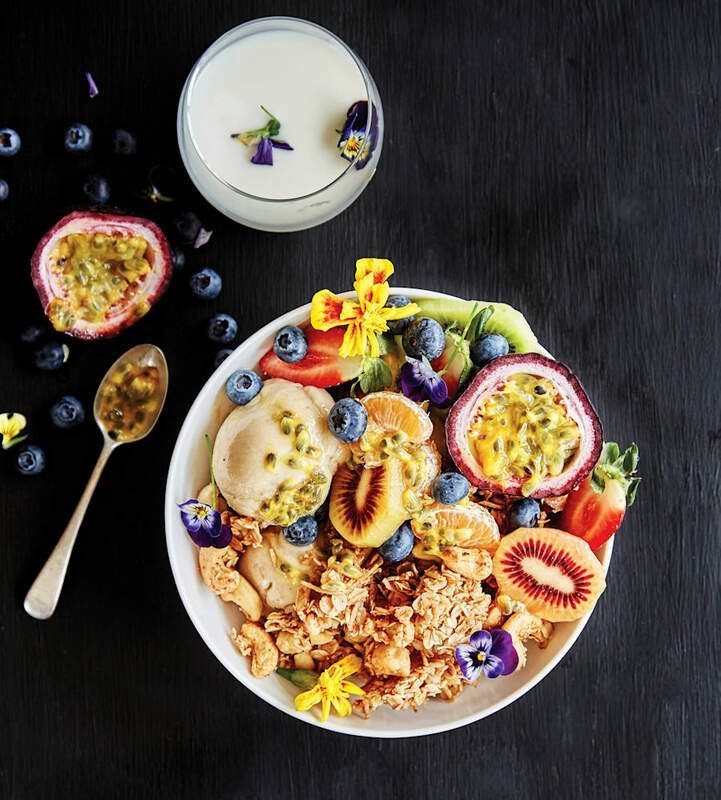 Divide nice cream between bowls and scatter with granola, fresh fruit and edible flowers (if using). Note: This makes about 600g of granola. A quick hint on the dates: if you're using fresh dates, they're easier to chop cold, so pop them in the refrigerator or freezer for 15 minutes before chopping. 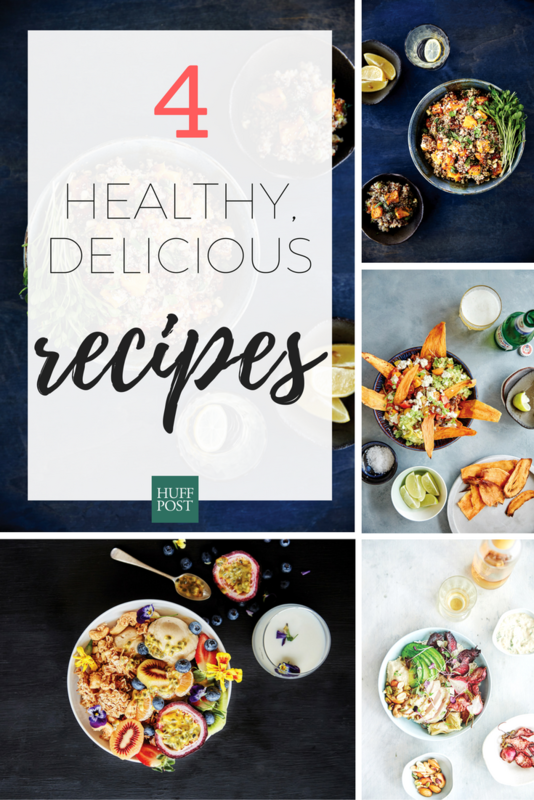 "In Cuban cooking, mojo applies to any sauce that is made with garlic, olive oil and orange juice -- here it doubles as the marinade for the chicken and the dressing for the salad," Lisle said. Gluten free, dairy free and sugar free. 1. To make the mojo marinade, combine all the ingredients in a medium bowl and whisk until combined. Reserve half the marinade for the citrus almond dressing. Place remaining mojo marinade in a bowl and add chicken. Cover and marinate for as long as possible, preferably overnight. 2. Place the beetroot and radishes on a lined baking tray and toss with olive oil, sea salt and pepper. Place chicken on the same tray (if your tray is large enough, otherwise use a separate tray) and roast in the oven for 15 minutes. After 15 minutes, remove the chicken from the oven and set aside to rest. Give the veggies a toss and roast for a further 5–10 minutes or until the beetroot is golden around the edges. 4. Heat oil or butter in a large frying pan to a medium temperature and add the cauliflower cous cous. Stirring occasionally, cook until the oil or butter has coated all the cauliflower and it is warm, about 5–10 minutes. 5. For the citrus almond dressing, place the remaining half of the mojo sauce in a bowl. Add the almond butter and coriander and stir to combine. Season to taste and add a few tablespoons of warm water until you reach a thick but pourable consistency. 6. To assemble, divide the cauliflower cous cous between the bowls. 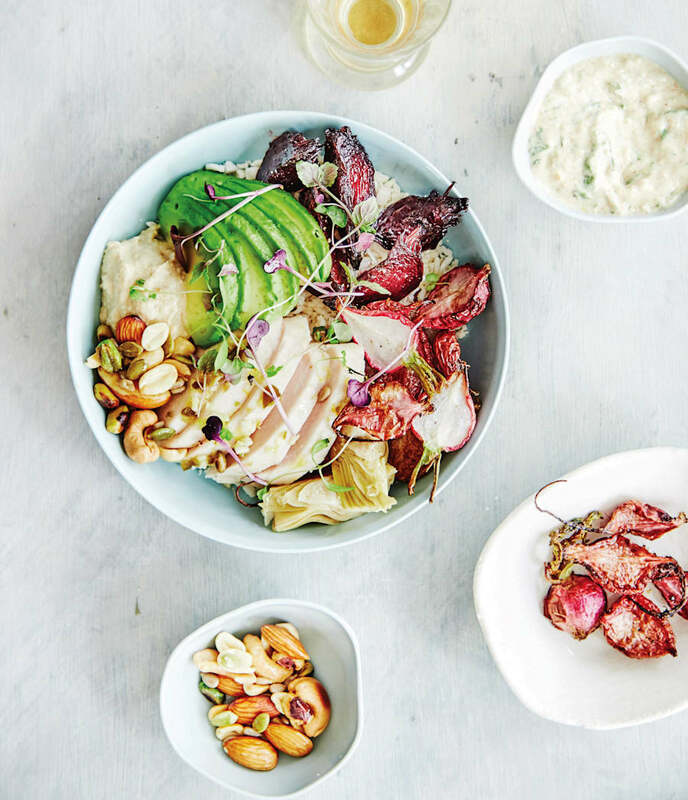 Slice the chicken and divide between bowls together with beetroot, radishes, hummus, artichokes and sliced avocado. Drizzle with citrus almond dressing, allowing it to seep through to the cauliflower cous cous. Scatter with mixed nuts and baby herbs. Now that's a delicious looking bowl. "If I had to choose my favourite recipe in this book, it would be this," Lisle said. "It is a great dish to have up your sleeve when cooking for family or friends with dietary requirements as it pleases pretty much everyone." Gluten free, dairy free, vegetarian, vegan and sugar free. 2. Start by roasting the pumpkin. Chop into cubes and place on a baking tray. Add olive oil and toss to coat. Bake for 30–40 minutes (tossing halfway through) or until the pumpkin is tender and golden around the edges. Set aside and allow to cool to room temperature. 3. Place quinoa and broth in a small saucepan and bring to the boil. Reduce heat, cover and cook until the liquid has been absorbed and the quinoa is tender, about 15 minutes. Uncover, fluff the quinoa with a fork and set aside to allow to cool. 4. Place quinoa in a large bowl. Add roasted pumpkin cubes, spring onions, pea shoots, mixed sprouts (if using), herbs and chia seeds. 5. Combine vinaigrette ingredients in a small jug. Drizzle dressing over salad and toss to combine. 6. Divide between bowls and scatter with extra chia seeds, to serve. Double the batch for lunch and dinner for the following few days. "This dish embodies everything that I love about bowl food -- contrasting textures and a tangle of delicious little mouthfuls to create comfort food at its best," Lisle said. "I've substituted sweet potato with potato and made it without black beans and switched the beef mince for turkey mince -- as you can see, the variations are limitless." Gluten free and sugar free. 2. Peel and slice the sweet potato lengthways using a mandolin into 1.5 mm slices. 3. Place sweet potato in a bowl. Drizzle with melted coconut oil and toss to coat. Spread sweet potato, in a single layer, on lined roasting trays. Bake for 10 minutes, then turn over and return to the oven for a further 8–10 minutes or until the edges are golden. Depending on the sweet potatoes, they may need longer in the oven. Season with salt and allow to cool completely to crisp up. 4. To make the spicy Mexican beef, heat the oil in a large frying pan to a medium-high temperature. Add the onion, capsicum and garlic and cook until softened, about three minutes. Add the beef and cook, stirring to break up any lumps, for five minutes or until browned. Add the spices and tomato paste and cook for one minute, then mix in the tomatoes. Reduce the heat to low and simmer for 10–12 minutes. Add drained black beans and season with salt and pepper, to taste. 5. To make the jalapeño guacamole, scoop out the avocado flesh and place in a large bowl. Add all the remaining ingredients and, using the back of a fork, mash to combine. Taste and season. 6. 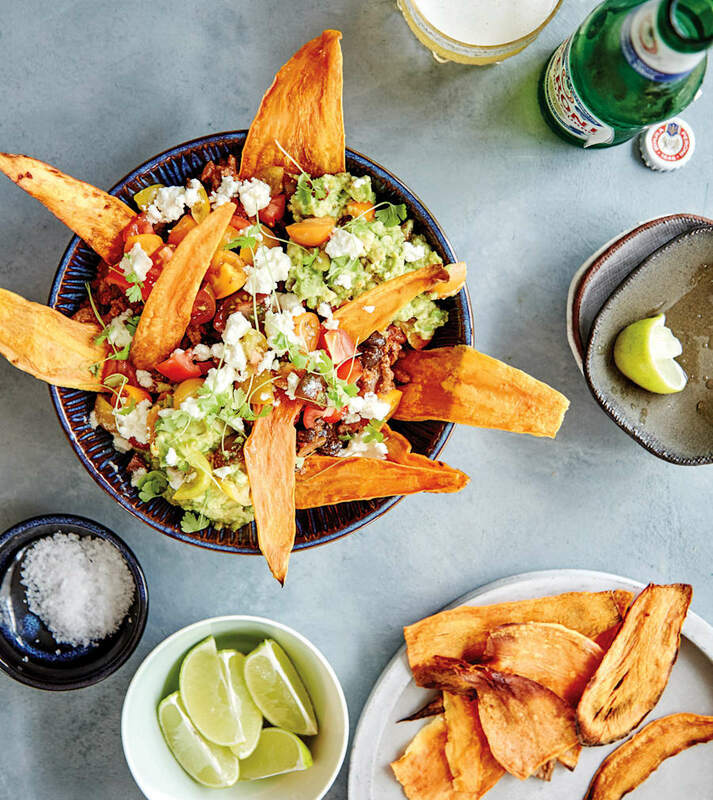 To assemble the nachos, divide spicy beef between bowls, top with guacamole and sweet potato chips and scatter with feta, tomatoes and coriander. Serve with lime wedges alongside. Subbing sweet potato for corn chips gives this nacho dish a nutritious boost. Recipes and images from Whole Food, Bowl Food by Anna Lisle, New Holland Publishers.